Starting in Bologna, the Giro dell Emillia will head out to and over the 19km Passo Brasimone before returning to San Luca where 4 laps of a tough 9km circuit will be completed. The race will end on the at the top of the 2km circuit climb and with an average gradient of 10%, it will definitely be a climber’s race. Our African Team will be made up by Steve Cummings, Songezo Jim, Igor Anton, Adrien Niyonshuti, Serge Pauwels, Natnael Berhane, Kanstantsin Siutsou and Daniel Teklehaimanot. The GP Beghelli will see the return of the fast man with less climbing on the menu in comparison to the Giro dell Emillia. Starting with s short loop into the province of Modena, the race will return to Bologna to finish with 10 laps of 13.3km course around Monteveglio. While the race will see the sprinters fancy their chances, there is still a 1.5km climb with an ave gradient of 7% each lap, but is does summit some 8km from the finish line. 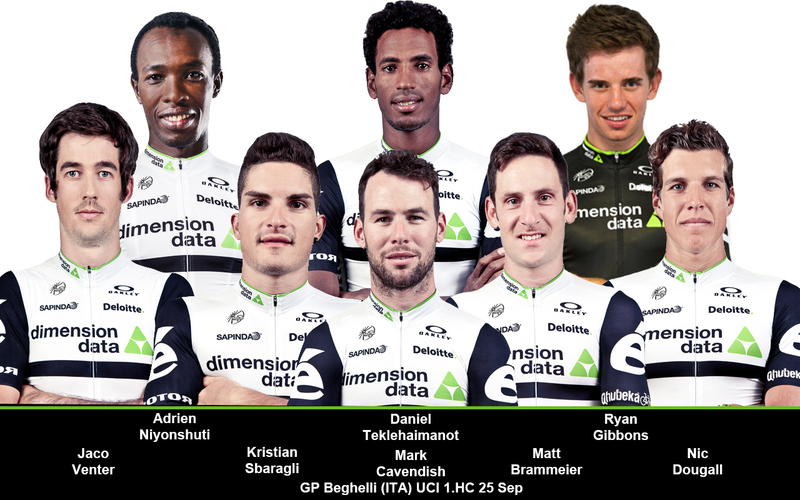 Mark Cavendish will lead our African Team at Beghelli and he will be supported by Daniel Teklehaimanot, Matt Brammeier, Adrien Niyonshuti, Nic Dougall, Kristian Sbaragli, our stagiaire Ryan Gibbons and South African champion Jaco Venter. I am just coming back into racing still but I am happy to see how quickly I am coming back to fitness. I look forward to working for the team this weekend as we have a good chance to win at both races. The races will be hard but we have good riders who want to win and can win. It will also be nice to be part of another victory with the team before the year ends, it will be a nice way to go into the off season after a good year for us so we will be trying with every opportunity until our last race.